In the heat of the regrettable diplomatic pettifoggery between Nigeria and South over the March 2, 2012 deportation of 125 Nigerian travelers from the O. R. Tambo International Airport on account of their failure to produce authentic yellow-fever immunization cards, Nigeria’s foreign minister Olugbenga Ashiru inaugurated what one might call the dawn of an era of diplomacy of reciprocal deportation. I confess to feeling a sneaky frisson of delight over Mr. Ashiru’s diplomatic bravado. Like many Nigerians, the retaliatory actions against South Africa stroked my hitherto dormant patriotic fervor and filled me with an exaggerated sense of importance as a Nigerian. I said to myself: finally, the giant has woken up from his dreamless slumber! But I felt ashamed of myself after I gave a deeper, sober thought to the issue. Three reasons informed this. First, the reason the Nigerian travelers were deported from Johannesburg was because they allegedly had fake yellow-fever vaccination cards. South Africa requires proof of yellow-fever vaccination from residents of 40 countries in the world, Nigeria included. So it’s obvious that Nigeria wasn’t deliberately or unfairly targeted. According to South African officials, the yellow-fever vaccination cards that many of the Nigerian travelers presented on arrival at Johannesburg had radically divergent signatures even when some of the cards putatively came from the same source. This isn’t the least bit surprising. We all know that yellow-fever immunization cards are often sold in the open at Nigeria’s international airports by desperate scammers for about 1000 naira. No government that is concerned about the health of its people will let in people into its country who have not produced authentic health clearance documents. The Nigerian government’s argument that our country has been certified yellow-fever free by the World Health Organization and that there has been no case of yellow fever in Nigeria since 1995 is a valid one. 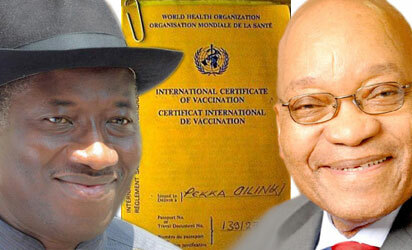 But the government should have presented the clean bill of health the WHO gave to Nigeria to South African government officials long ago so that Nigeria would have be taken off the list of 40 countries whose citizens must produce evidence of yellow-fever vaccination as a condition for entry into South Africa. That would have avoided this embarrassingly juvenile diplomatic friction. Second, I wonder what diplomatic epiphany suddenly inspired our government, which didn’t even care to update our yellow-fever status with other countries in the world, to begin to care about what happens to its citizens at another country’s airport. The fact that our government didn’t deem it worthwhile to inform South Africa—and other countries that require a yellow-fever vaccination card from some countries—that Nigerian had been yellow-fever free since 1995 is sufficient proof that the government doesn’t really care what happens to ordinary Nigerians who travel abroad. So what explains the sudden hypersensitivity to the deportation of Nigerians in South Africa? Well, you guessed it: some of the deportees, according to many accounts, are relatives of top government officials. This eerily recalls Olusegun Obasanjo’s hotheaded closure of the Nigeria/Benin Republic border in August 2003 reputedly to stop smuggling and banditry. The real reason was, of course, that Beninese armed robbers attacked his daughter, Iyabo Obasanjo-Bello, and her entourage. Talk of the personalization of political power! Thirdly, the Nigerian government has had another excellent opportunity to put to test its new diplomacy of reciprocal deportation but has so far failed to put it to use. On March 10, according to news reports, no fewer than 120 Nigerians were deported from the UK in a cargo plane. Yes, a cargo plane! That’s infinitely more dehumanizing than being turned back at the airport for failure to present authentic immunization cards. So far, I haven’t heard the frenzied, impassioned cries of outrage that I heard from Nigerian government officials during the diplomatic spat with South Africa. What happened to the diplomacy of reciprocal deportation that our foreign affair minister says will now underline our foreign policy? Recall the minister said, “The signal must go out not just to South Africa but to the rest of the world that when you treat Nigerians with disrespect, we also will find a way of treating your nationals with disrespect.” Should we expect the mass deportation of British citizens in cargo planes in the spirit of the new diplomacy of reciprocal deportation? Of course, that won’t happen. One thing is clear in all this. Nigeria reacted the way it did to South Africa because it’s an African country ruled by a black African. Our government will never dare do the same thing to any country in Euro-America. For many of our leaders, white is always right and black is forever wack. And that is where the problem lies. Until we can have enough self-esteem to deal evenly with diplomatic slights from all corners of the world, including the white world, Ashiru’s policy of reciprocal deportation will only invite ridicule to Nigeria. I do not by this intend to mitigate the well-documented rise of xenophobia in South Africa. It is often said that the only people more hated than Nigerians in South Africa are Zimbabweans. This is sad on so many levels. Having just recently risen from the ashes of decades of racial and economic injustice, South Africa should be a beacon of tolerance and inclusion. But this is not about South African xenophobia; it’s about Nigeria’s diplomatic double standards and incompetence. "Another intervention programme of the Government is the Subsidy Re-Investment Programme (SURE-P), a social safety net, aimed at alleviating the impact of the oil subsidy removal on vulnerable populations. Under this programme about 10,000 women and youths are employed in each state of the Federation to carry out public works." Really? When did that happen? The last time I heard of SURE, President Goodluck Jonathan said he wasn’t sure of it any longer. How can a program that has been killed before it was even conceived provide employment for 10,000 people? Some abracadabra! Another great piece, prof. Keep up the good work.